Here it is the last of the ground beef from the freezer. This incarnation has it as an ingredient in a spaghetti sauce. As usual if you want to make the dish vegetarian omit the ground beef. It is just as good with lots of sautéed mushrooms. With all the doctoring I did to my jar of spaghetti sauce (I sautéed onions, ground beef, mushrooms, garlic, and tomato paste plus oregano and chili flakes) I might as well as have made the sauce entirely from scratch. Also, this is too much for me to eat. There are leftovers in the refrigerator for John to eat on another night. 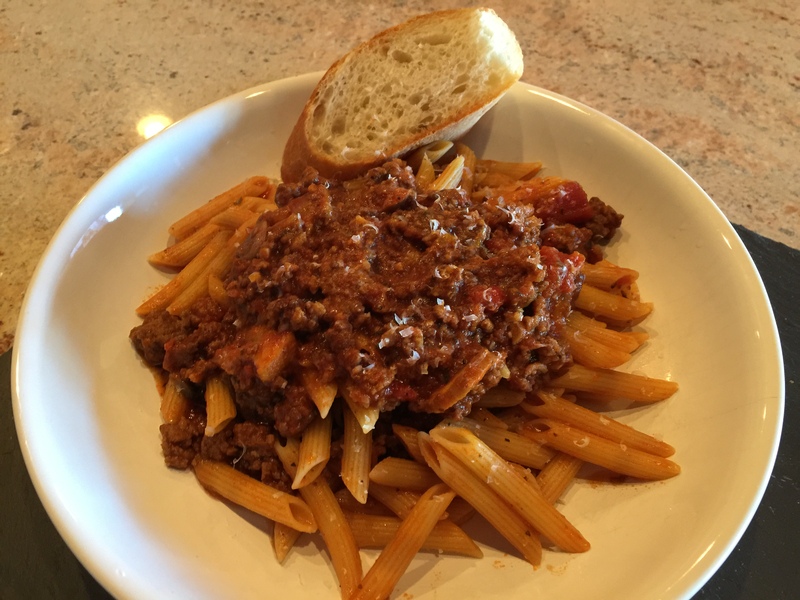 This entry was posted in Beef, Pasta, Vegetables and tagged garlic, ground beef, mushrooms, Onions, pasta, penne, spaghetti sauce, Vegetables. Bookmark the permalink.